A queue of transactions awaiting completion. Transactions in the queue may be fully processed, but not yet delivered, or only partially processed. HTTP/1 pipelined requests can be processed out of order but responses MUST be written to the client in-order. The front() context is for the response writing transaction. The back context may still be reading a request payload/body. Other contexts are in deferred I/O state, but may be accumulating payload/body data to be written later. HTTP/2 multiplexed streams can be processed and delivered in any order. For consistency we treat the pipeline as a FIFO queue in both cases. Definition at line 40 of file Pipeline.h. References add(), back(), front(), and ~Pipeline(). Definition at line 20 of file Pipeline.cc. References debugs, nrequests, and requests. Referenced by Pipeline(), and Http::Stream::registerWithConn(). Definition at line 40 of file Pipeline.cc. 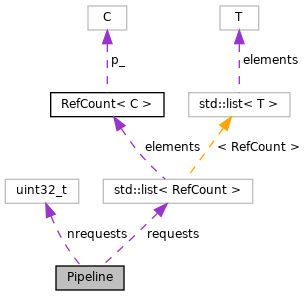 Referenced by ConnStateData::checkLogging(), and Pipeline(). Definition at line 53 of file Pipeline.h. Referenced by Ftp::Server::doProcessRequest(), and Ftp::Server::processParsedRequest(). Definition at line 56 of file Pipeline.h. References popMe(), requests, and terminateAll(). Referenced by ConnStateData::checkLogging(), ConnStateData::clientPinnedConnectionRead(), ConnStateData::getSslContextStart(), ConnStateData::httpsPeeked(), ConnStateData::notePinnedConnectionBecameIdle(), ConnStateData::sendControlMsg(), and ConnStateData::splice(). Definition at line 28 of file Pipeline.cc. Referenced by clientSocketRecipient(), clientTunnelOnError(), Server::clientWriteDone(), Ftp::Server::connectedForData(), ConnStateData::doneWithControlMsg(), Ftp::Server::doProcessRequest(), ConnStateData::finishDechunkingRequest(), ConnStateData::getSslContextStart(), Ftp::Server::handleDataReply(), Ftp::Server::handleEprtReply(), Ftp::Server::handleEpsvReply(), Ftp::Server::handleFeatReply(), Ftp::Server::handlePasvReply(), Ftp::Server::handlePortReply(), Http::One::Server::handleReply(), Ftp::Server::handleReply(), Ftp::Server::handleUploadRequest(), ConnStateData::httpsPeeked(), httpsSslBumpStep2AccessCheckDone(), Ftp::Server::notePeerConnection(), ConnStateData::parseTlsHandshake(), Pipeline(), ConnStateData::postHttpsAccept(), Ftp::Server::replyDataWritingCheckpoint(), Ftp::Server::setDataCommand(), Ftp::Server::setReply(), ConnStateData::splice(), ConnStateData::startPeekAndSplice(), tunnelClientClosed(), tunnelServerClosed(), Http::One::Server::writeControlMsgAndCall(), Ftp::Server::writeErrorReply(), Ftp::Server::wroteEarlyReply(), Ftp::Server::wroteReply(), and Ftp::Server::wroteReplyData(). Definition at line 64 of file Pipeline.cc. References assert, debugs, and requests. Referenced by empty(), and Http::Stream::finished(). Definition at line 52 of file Pipeline.cc. Referenced by Server::doClientRead(), and empty(). Number of requests seen in this pipeline (so far). Includes incomplete transactions. Definition at line 66 of file Pipeline.h. Referenced by add(), ConnStateData::checkLogging(), and statClientRequests(). Definition at line 70 of file Pipeline.h. Referenced by add(), back(), count(), empty(), front(), popMe(), and terminateAll().